For starters I did not pick the most flattering dress concept. From my vast dress-wearing experience I know I don’t wear strapless well. It’s just too much skin. I have horrible posture when I feel exposed. Strapless dresses scare me. That said, I went ahead and made this dress. On one hand I love that this is made from two of Regan’s old button-front shirts. Reusing old stuff is just so satisfying. I scoured the internet to find a fitted sun dress made from a men’s shirt. There are plenty of tutorials for dresses for baby girls, but not so much for grown women. I did find this tutorial online, but realized that the use of elastic on me would be remarkably unflattering so I decided to forge ahead and figure out a unique fitted option on my own. I had a nice time dreaming up a way to create a dress using different parts of this men’s size large shirt (you might be amazed at the amount of fabric hidden in those shirts!). The bust is made from both sleeve caps sewn together for a bit of reinforcement. There are just a few darts added to make the dress take shape. The front of the skirt is made from the back of the shirt and the back of the skirt is made from the front of the shirt. The button panel works nicely in place of a zipper. 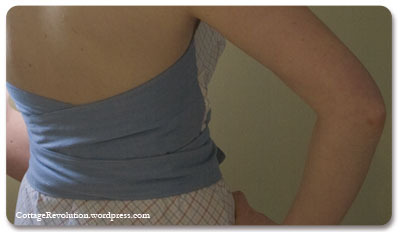 The blue sash at the waist, which also doubles as the back of the body of the dress, is made from cutting another size large shirt into strips — enough to wrap around my waist 3 times (or twice if I tie in the back). I’d give you a nice close up of the buttons in action, but this is a dress to be worn with a slip… a slip I don’t have. By not providing the button detail in back I am sparing you a closeup of my underwear glaring through the fabric. Besides having to wear a slip with the dress there are a few other things I’m not fully embracing about this number. Its lack of structure in the body makes it look a bit frumpy. If I ever actually wear this out of the house it will be accompanied by a cardigan. Also, the sash takes a while to adjust properly. And, as I covered at the beginning of the post, this is a strapless dress. It scares me. Anybody have any inspired reuse/refashion projects currently in the works? OMG. Love this dress. Love. It. For real. You have beautiful shoulders and back for a strapless! I love the sash/back, super chic! I don’t have reuse projects in the work, but have a few in mind when there is finally time! I’d like to use some of our old sheets (like the ones that Priam has chomped a whole in) to make a rag rug for the bathroom! Thanks all for the comments. It was a fun thing to make.